While technically part of the movement sequence, the Battle Procedure deserves its own section. The most interesting part of the Movement Sequence is when you move your Army Stack into the same space as an enemy Army Stack, Town, or a Guard Stack. It is at this point that a battle is conducted. Heroes of Might & Magic is, after all, a war game, and winning battles is what the war is all about! For this section, the Aggressor is the player who moved his Army Stack into a space with Guard Stack or an enemy Army Stack. The other party in the battle is the Defender. Aggressors usually have the advantage, so if you can manage, you want to be the one who attacks! There is one exception. Defenders have the advantage in battles taking place at Towns. Towns are very difficult to attack, because they are fortified and most of the fighting must be done through a small space. Unlike most CCGs, there are significant tactical concerns in Heroes of Might & Magic. When a battle begins, the Aggressor must set up his forces first. To do so, he takes his Army Stack and separates it into Creature Stacks. A Creature Stack is a group of Unit Cards of the same type. A Creature Stack will act as a single unit in combat. You may have up to 7 Creature Stacks in an Army. Heroes make up their own Creature Stack and cannot be stacked with other Heroes. For example, in an Army Stack containing 3 Bandits, 2 Orcs, an Efreeti, a Sorcerer Hero and a Thief Hero, you would have 5 Creature Stacks. Since you are allowed to have as many as 7 Creature Stacks, you could choose to break up your Bandits, Orcs, or both into multiple stacks, so long as you end up with no more than 7 stacks. Once the battle starts, however, you cannot join or separate units from their Creature Stacks. When the Aggressor’s troops are divided into Creature Stacks, he then places each Creature Stack on either the Melee Line, or the Ranged Line. The Melee Line: The Melee Line is the Front Line of combat. Creature Stacks placed on the Melee Line may be attacked by enemy units using their Melee Attack Scores. You may place as many of your Creature Stacks on the Melee Line as you like. However, there must be at least 3 Creature Stacks on the Melee Line before you can place any Creature Stacks on the Ranged Line. 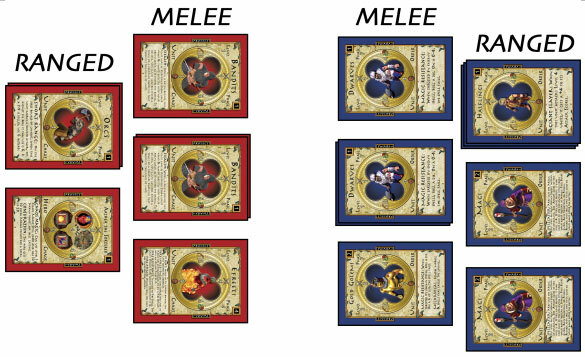 In fact, during a battle, if the number of Creature Stacks you have on your Melee Line drops below 3 (a Creature Stack is killed for instance), then a Creature Stack from the Ranged Line must instantly be moved up to the Melee Line to take its place. The Ranged Line: The Ranged Line is considered the Rear in combat. Creature Stacks placed here may only make Ranged Attacks (or cast spells), until they are moved up to the Melee Line. More importantly, such units can only be targeted by Ranged Attacks. This is because your Melee Line is considered an “obstacle” for both you, and the enemy. “Obstacle” is an important term, because some Units have special abilities that allow them to ignore obstacles. If a Creature Stack has a special ability (such as flight) allowing it to ignore obstacles, it may make Melee Attacks against targets on the Ranged Line. By the same token, such special Creature Stacks may make Melee Attacks from their Ranged Line. Doing so however, automatically moves them up to their Melee line.